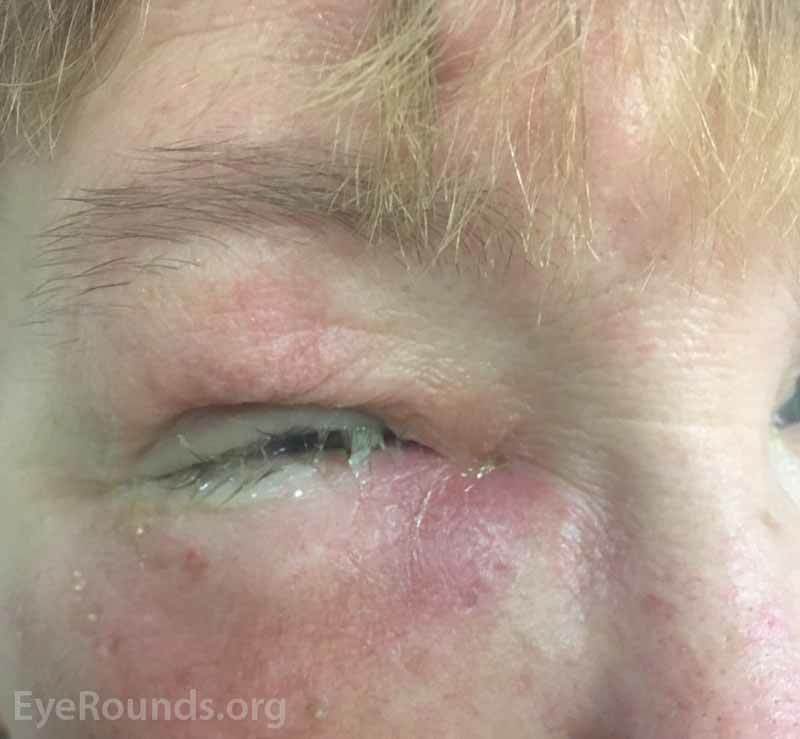 A 51-year-old woman presented with chronic dacryocystitis secondary to obstruction of the nasolacrimal duct (NLD). Her symptoms included persistent tearing and difficulty with vision due to discharge. Examination showed purulent drainage along the right medial canthus, overlying erythema, and pain upon palpitation (Figure 1). 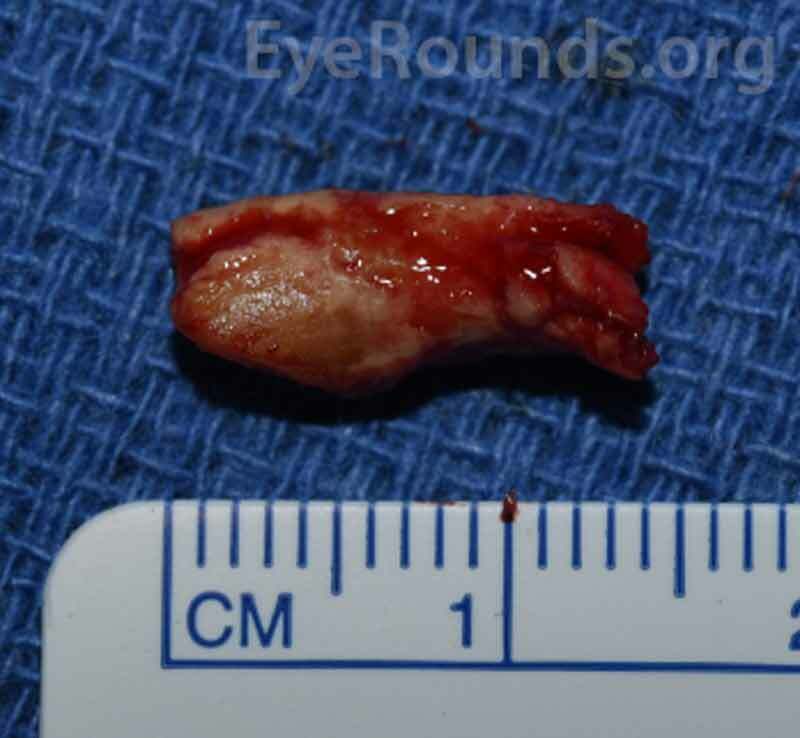 The patient subsequently underwent endoscopic dacryocystorhinostomy and a large dacryolith (Figure 2) was removed from the lacrimal sac. The patient had complete resolution of symptoms one week after surgery (Figure 3). Composed of devitalized epithelial cells and calcified amorphous debris, Dacryoliths often lead to lacrimal sac distension and potential obstruction of the nasolacrimal duct . The treatment for chronic dacryocystitis requires opening of the lacrimal sac and nasolacrimal duct. If no tumor is suspected, then no further diagnostic evaluation is needed to confirm the diagnosis of NLD obstruction . Figure 1: External photograph of the right periocular area demonstrating erythema and fluctuance of the skin overlying the nasolacrimal sac. Figure 2: External photograph of the removed dacryolith, which measured 1.4 cm in length. 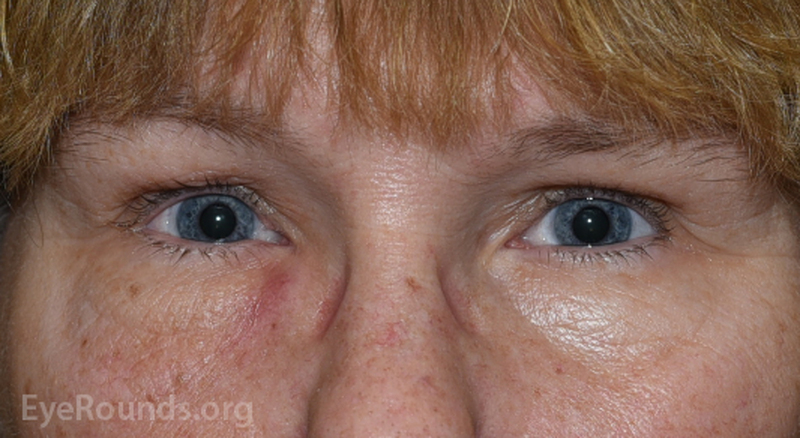 Figure 3: Post-operative photograph taken one week after surgery shows interval resolution of edema, erythema, and swelling overlying the area of the nasolacrimal sac. Gadepalli C, Malik V, Inkster C, Lobo C. Dacryolith in an unusual case of epiphora: open or endoscopic approach? J Laryngol Otol. 2011 Dec;125(12):1298-300. doi: 10.1017/S0022215111002076. Epub 2011 Aug 19. PubMed PMID: 21854672. Yazici B, Hammad AM, Meyer DR. Lacrimal sac dacryoliths: predictive factors and clinical characteristics. Ophthalmology. 2001 Jul;108(7):1308-12. PubMed PMID: 11425692. Ophthalmic Atlas Images by EyeRounds.org, The University of Iowa are licensed under a Creative Commons Attribution-NonCommercial-NoDerivs 3.0 Unported License. copyright ©2016 The University of Iowa.